Today I will introduce you to the Pascola masks of Crisencio Molina Maldonado. Crisencio was born on 9/19/1957, in Pitahaya, Sonora. Presently he lives in Potam. As a young man, he was trained by his father to perform as one of the deer singers during Yaqui fiestas. His father, whose informal name is Miki Maaso, was the lead Deer singer and Miki’s compadre, Luis Maaso, was the Deer dancer they sang for, when this group traveled from Sonara to participate in Tucson fiestas at the Barrio Libre community. Later they performed at Old Pascua. Some anthropologists recognized Crisencio as a valuable cultural consultant. In about 2004, my friend Tom Kolaz was pleasantly surprised to discover that Crisencio was also a talented mask maker. At that time Cresencio brought his masks with him when he attended Tucson fiestas, and I began buying his masks from Tucson merchants in 2006. Tom and I thought that Crisencio’s masks were very well carved, and that he was a superlative artist, so we began buying directly from the carver. In a series of posts over the coming weeks I will demonstrate the quality that so impressed us. Upon my discovery of Crisencio, I purchased a number of his masks, including those with the most traditional Pascola mask style, masks with human faces. Here is one of those. This one has a beak-style mouth, a feature that is found in masks from the beginning of the 20th century. In my last two posts you have seen Pascola masks by Frank Martínez with a variety of faces. Today I will conclude my discussion of this carver with four additional masks that have the faces of goats or rams, and then three changos (monkeys and apes). I purchased my first Pascola mask by Frank from Lupe Sinoui, the director of the Old Pascua Community Center, in 1989. I chose it from a group of masks that Frank had probably made in that year or the one before. Later I traded it to David West, the owner of Gallery West in Tucson. 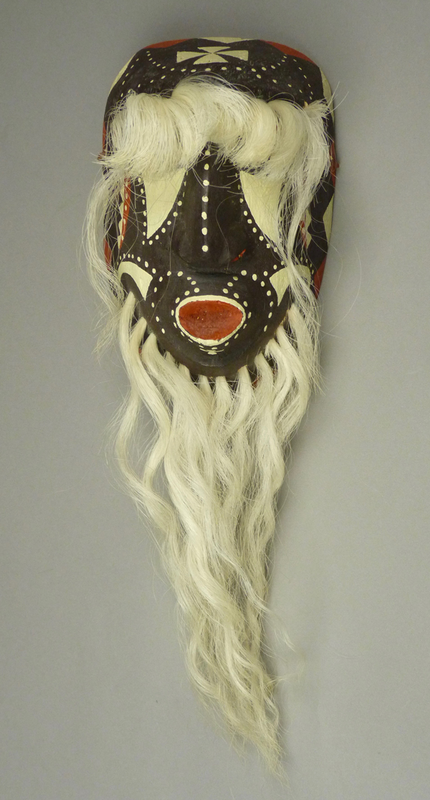 Here are photos of this Goat faced mask that I took when it was still in my collection. Isn’t it handsome? In this second post about the masks of Frank “Chico” Martínez, we will look at animal Pascola masks with prominent teeth or fangs. The first four are Coyote masks. To introduce these I will refer again to the article by Tom Kolaz — “Yoeme Pascola Masks from the Tucson Communities: A Look Back” (pp 50- 61); here is the link. That article opens with a photo of three masks carved by Frank Martínez—a “Coyote” carved in 2001, an Owl from the early 1990s, and a “Chango or Ape face from the early 1980s. I am going to show you three like that Coyote mask, and next week I will show you Chango masks. Note that all of the masks with catalogue numbers in the Kolaz article are from the collection of the Arizona State Museum (ASM) in Tucson, Arizona. I bought the first of these Coyotes on EBay™ sometime around 2005. A tag on the back said it had been carved in 1986. For some reason the back had been varnished. “Yaqui Pascola Masks From the Tucson Area,” in the Winter 1985 issue (pp. 38-45), and “Yoeme Pascola Masks From The Tucson Communities: A Look Back,” in the Summer 2007 issue (pp. 50- 60). Here is a link to view the second article. I had discovered Frank’s masks when I first visited Tucson in 1989. I learned more about him when I met Tom Kolaz, several years later. Today I am going to show five masks by Frank with Human faces, along with a mask with the face of a snake and another with the face of a horse. I will start off with a mask that was originally collected from Frank by Martha Secan in 1985. Martha was a great fan of this carver, and she deliberately bought and sold his masks as a means of supporting him as an artist. She died in 2003. I bought this mask in 2014 from a Tucson woman who had purchased the mask from Martha. Back in 1985 Frank usually painted his masks with flat colors.